Just checking in. I’ve been knitting on my new Meshed Hat. Its been with me wherever I go. Hats make for nice traveling projects. But the photography suffers a bit! My spontaneous “candid” pictures never turn out quite as well as the staged ones. … and taking pictures are every critical trivial step. What can I say? Long color repeat yarns keep me endlessly fascinated. I’m always excited to “get to the next color!”. So the first time the Gina yarn changed colors I had to stop and get a picture of it. Of course I did. 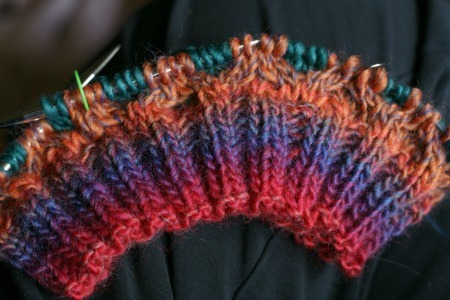 And again when I finished the ribbing. 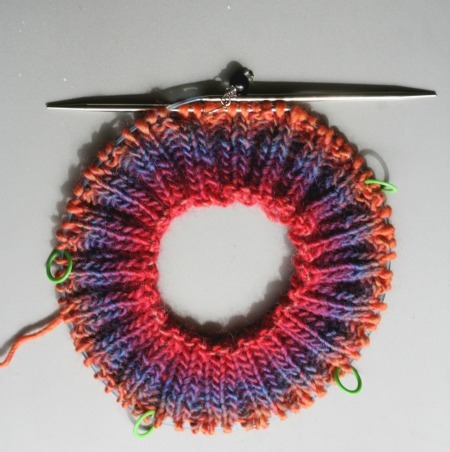 Picture taking may take away from valuable knitting time but it looked like a burst of color! Had to stop. Then there was the joining in of the second yarn. Does any one else feel like that is a big moment in a colorwork project? Does any one else secretly feel the need to stand up and announce “Hey I’m adding the new color now! Come check it out!” to everyone within earshot? Maybe its just me. 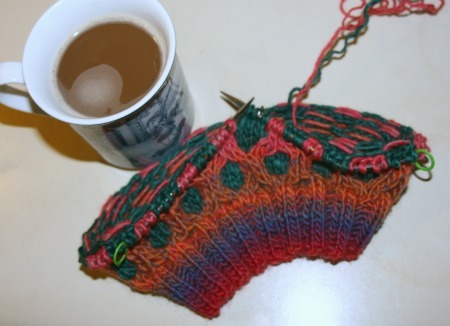 And then I was back at home with a cuppa and my in-progress hat. I do love those colorful cables. I’m so in love with this style of colorwork that I’m planning another design using this technique. But until then, you can get this pattern from ravelry (if you don’t have ready have it!) and join me in the knit-a-long. 2. Keep a loose tension. 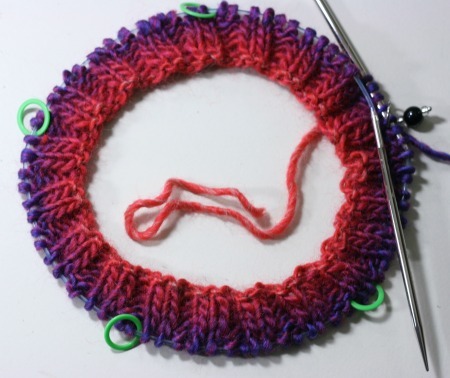 When you knit cables there is a tendency to pull tight but resist that. Cables tighten up all on their own. Plus this is colorwork and colorwork always looks best at a relaxed tension. Maybe you’re making one with me or maybe you’re just enjoying the pictures. Either way, feel free to drop in on me and my in-progress Meshed. 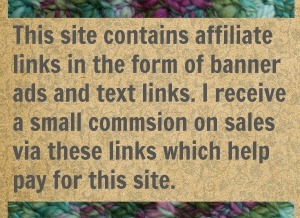 7 Comments on "Meshed Hat Knit-A-Long Part 2"
I love the colors. This is going to be a pretty hat. I am in! Of course, I am behind on pictures. Will post later. But I am on round 1 of the body. Nice! 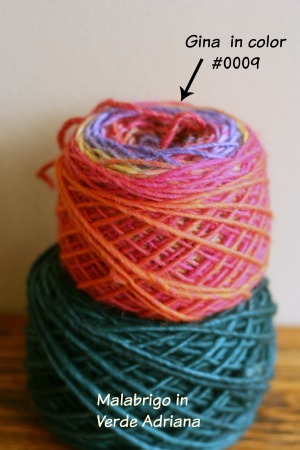 What yarns are you using? 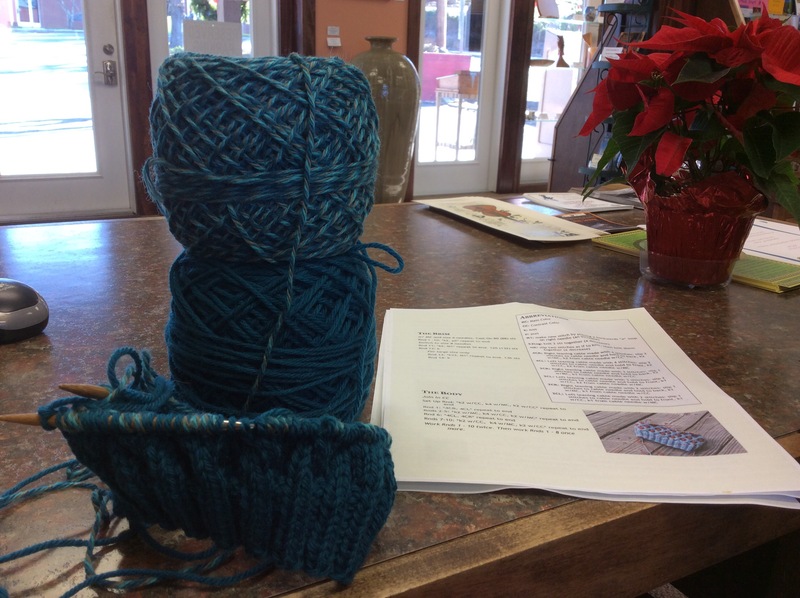 Both are cascade yarns. They are lighter than the picture shows. My sister has a teal colored jacket and I thought this would be perfect. Ahh so its for your sister. That’s okay, lol. 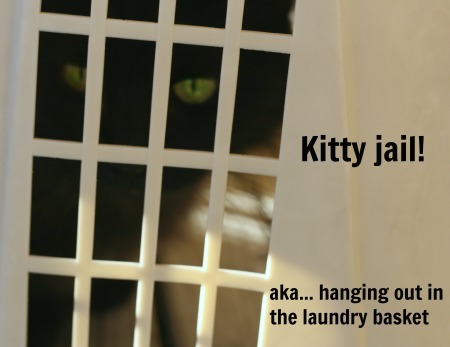 I’m sure I can talk you into making one for yourself….